LOS ANGELES – Shakira’s alleged new romance with football star Gerard Pique has hit headlines again after a picture of them kissing was printed on the cover of a magazine. The Colombian superstar announced back in January that she had split from her longtime boyfriend, Antonio de la Rua. The couple insisted they “view this period of separation as temporary,” but Shakira sparked rumours the relationship is over for good when she was linked to FC Barcelona star Pique. Photographs of the pair holding hands emerged last month, with bosses at the photo agency behind the snaps insisting the images were leaked without permission. 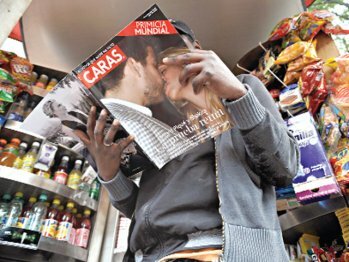 Now a new snap has got fans talking – a photograph on the cover of a Colombian magazine shows the singer locking lips with her rumoured new lover. Both stars have previously denied rumours of a romance.